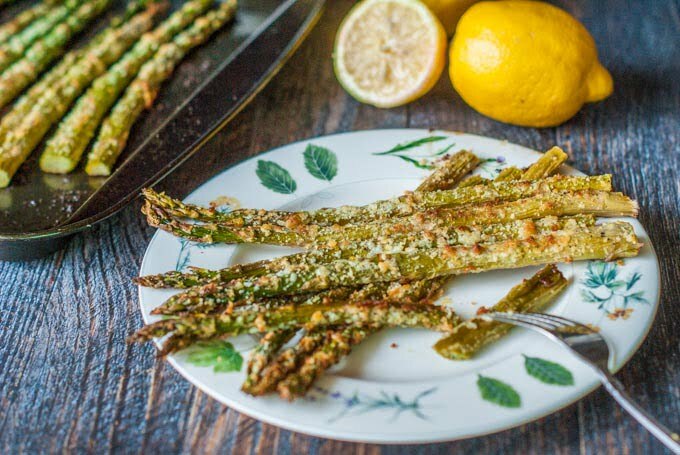 Roasted Lemon Parmesan Asparagus - Easy low carb side dish! 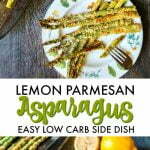 Roasted Lemon Parmesan Asparagus – Easy low carb side dish! 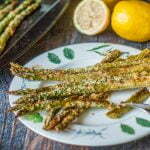 This roasted lemon Parmesan asparagus recipe is perfect low carb side dish for Spring. An easy, tasty and healthy side dish with only 2.4g net carbs per serving! You might also like this wrapped asparagus with goat cheese! Asparagus in general is a good low carb vegetable and has such great taste. 1 cup has only 32 cals and 0.6g net carbs! It’s high in vitamin K, it’s a natural diuretic and a great source of fiber. Learn more about the benefits of asparagus here. As I mentioned above we like it just steamed with a bit of butter. However roasting it gives it a depth of flavor and the Parmesan cheese adds a savory, crunchy coating. The lemon zest just brightens the whole dish! If you like asparagus, I have many recipes on the blog. One is asparagus with green goddess dressing or wrapped asparagus with goat cheese and I’ve even made asparagus noodles! To make this dish, just clean your asparagus and cut off the woody ends. Then place them on your cookie sheet and drizzle oil, cheese, zest and garlic. I used my hands to make sure the spears were well coated and then sprinkled a bit more cheese on top. 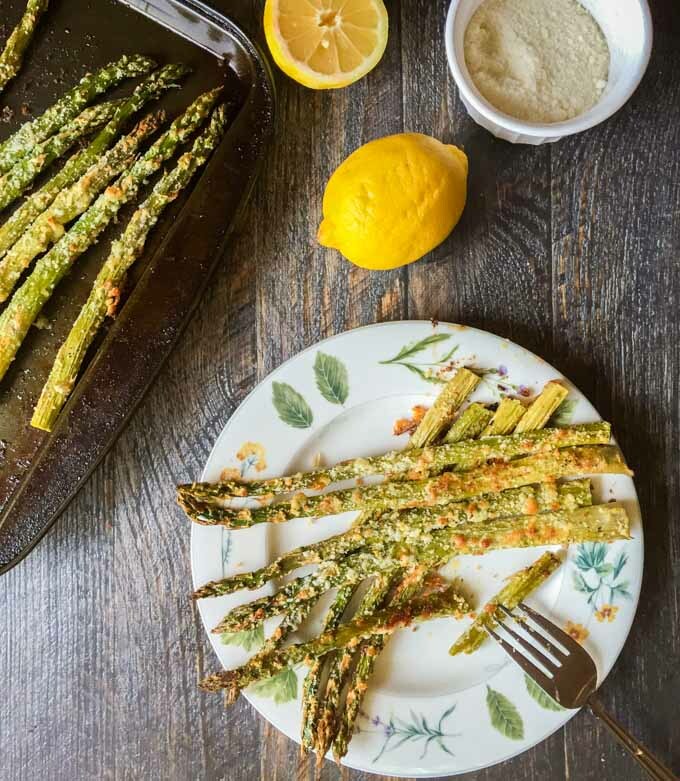 Pop them in the oven for about 20 minutes and out comes some lovely, lemony and cheesy asparagus spears. 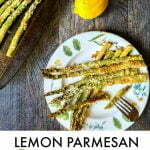 This lemon Parmesan asparagus recipe is perfect for Spring. An easy, tasty, healthy side dish with only 2.4g net carbs per serving! Spray a cookie sheet with cooking oil. Clean your asparagus and cut off the woodsy ends. Add your asparagus, olive oil, garlic, zest and 2 Tablespoons of the Parmesan cheese. Mix with your hands to make sure the asparagus is covered with the cheese mixture. Sprinkle remaining 1 Tablespoon of cheese. 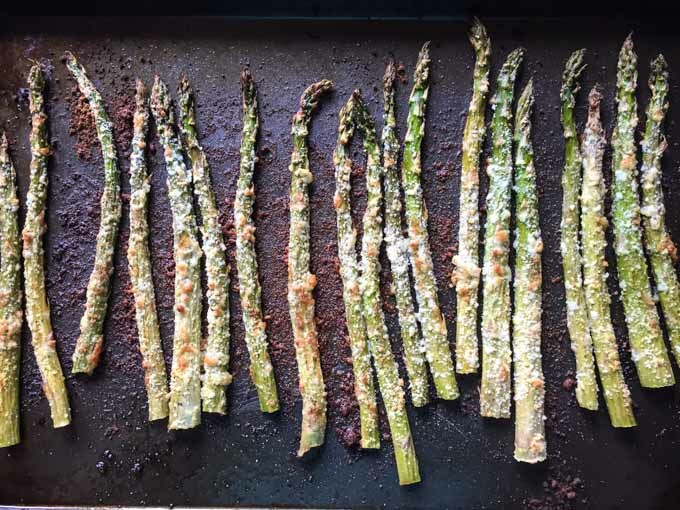 Bake for 15-20 minutes depending on the size of you asparagus. Thank you for this recipe! It is awesome! Since I only had a small lemon in the house I opted to also add the juice of the lemon to the mixture (as well as a good pinch of hot pepper flakes). Turned out very yummy! Also my asparagus was a bit on the thin side and 20 minutes in the oven was almost a bit to long. In future I will start testing the spears after 15 minutes. So glad you liked it! That’s a good idea about the lemon juice. I will try that myself next time. Also good point about baking time depending on the size of the asparagus. My husband (for some odd reason) does not like thin asparagus so mine were on the larger size. Thanks for taking the time to comment! You have lemon listed in the ingredients but it was not used. Why?? Thank you for bringing that to my attention. I meant to say the zest of one lemon. I fixed the recipe. Thanks again for taking the time to comment! Do you mean a lemon “zested” rather than “tested”? How do you test a lemon? Hi Rachel, I just saw that…darn auto correct…by my fault for not proofreading better. And yes I meant the zest of one lemon. aren’t you supposed to break off the “woodsy” end? thought i’ve heard of that b-4! Yes you should cut off the woodsy end. I mention that early in the post but I didn’t write that in the actual recipe. i have never cooked asparagus, always thought it would be complicated, gotta try!! thanks. No problem at all! I’m glad you said something so I could add that to the recipe. And asparagus is very easy to cook. As I said in the post, a lot of times we just eat it steamed with a little butter. Hope you like it. Yes. Just hold the asparagus in your right hand and use your other hand to bend the lower end of the asparagus until it snaps off. I find this method never fails me and only the tender editable piece of asparagus is left to cook. Thanks for taking the time to comment and help out our readers! And yes you are right that is a great way to do it. 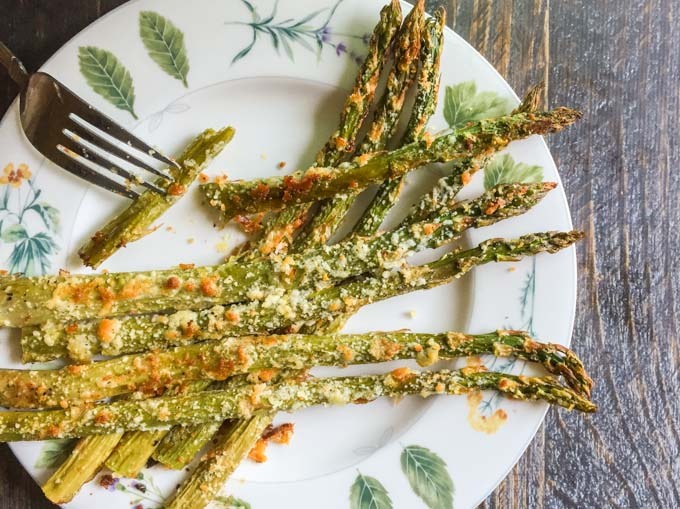 I love asparagus, this recipe is a keeper! Thanks! Thanks for stopping by Michaela!